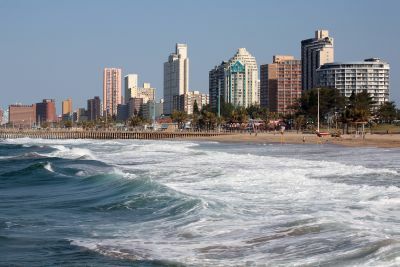 Durban is working towards becoming a green event hosting destination: committed to continual improvement in hosting major events in a sustainable manner that protects and enhances the natural, social, and economic environment. But we need your help. I understand that the majority of South Africa’s energy is generated from coal, a non-renewable resource, and that I must conserve energy where possible. I therefore commit to switching off all lights when I am not in the room, minimising the use of air conditioning, and turning off / unplugging appliances instead of putting them on standby. I understand that Durban is situated in a water scarce region, and that I must use water wisely. I therefore commit to not leaving the tap running while brushing my teeth, taking shorter showers, adhering to the towel reuse policies in accommodation establishments, and supporting any other water saving initiatives. I understand that the majority of Durban’s solid waste goes to landfill sites, and that I must reduce, reuse, and recycle. I therefore commit to avoiding overly packaged goods, drinking Durban’s tap water, which is safe to drink, instead of bottled water, reusing shopping bags, and separating my waste into the appropriate recycling bins, where they are provided. I understand that vehicles emit carbon dioxide (CO2) which contributes to global climate change, and that I should give the car a rest. I therefore commit to walking, riding a bike, or using public transport whenever possible. I understand that organic and locally produced food, drink, and arts and crafts, generally have a smaller carbon and ecological footprint than imported products. I therefore commit to making responsible choices about the products I use, and in doing so, also supporting local businesses and community development projects. I understand that Durban is situated in an area rich in biodiversity, and offers tourists a wide range of outdoor attractions and experiences. I therefore commit to supporting the conservation of these natural areas by participating in outdoor experiences such as visiting a local nature reserve. And finally, if you feel there is anything else we could be doing to make Durban a more sustainable destination, please submit your suggestions to the Environmental Planning and Climate Protection Department, eThekwini Municipality, Manisha Maganlal, maganlalm@durban.gov.za.